As part of the eCampus Ontario – Extend Modules, there is a commitment to open, accessible, evidence of learning. 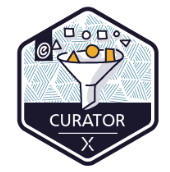 In order to verify the learning that has occurred, and receive a digital badge as validation, I have collected all the elements of the curation module here into one location. This is my performance moment – on stage to present my completed module to the adjudicators. Explored Creative Commons Licenses and compared them to Copyright. Used Boolean operators and limiters to refine searches. Explored repositories to curate content that meet specific learning goals. Used the CRAAP test to evaluate OER. Reflected on using OER when designing, developing and revising courses or workshops.